Agrotechnomarket.com -Engineered with strength and reliability that is launched by PrecisionHawk, the Lancaster 5 Drone is 180% more robust than its predecessor with highly advanced data processing and flight safety operation. Designed to survive hard landings and carry the widest range of aerial sensors, the PrecisionHawk Lancaster 5 Drone is perfectly-suited for challenging applications across multiple industries even in unpredictable environmental conditions. The Lancaster 5 Drone is price tagged $25,000+. The PrecisionHawk Lancaster 5 Drone is fully UAV and easy to use. Throw it like a paper airplane to launch and it automatically optimizes its flight plan to ensuring optimal data collection in the most efficient way. After completing the mission, it lands itself. With smart flight controls, the drone adjusts to various payloads and unfavorable environmental conditions to get the needed data. The PrecisionHawk Lancaster 5 Drone is equipped with plug-n-play sensors that can be swapped in the field without configuration. Now the farmers have access to more types of data than ever before to deliver the right information for software. 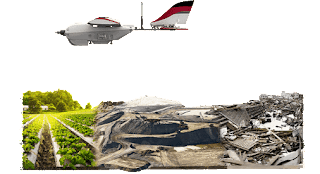 The PrecisionHawk Lancaster 5 Drone is added a ruggedized chassis to withstand hard landings on rugged terrain and unfavourable environmental field conditions. In addition, the Lancaster Drone is designed with new tail structures and a longer wingspan making it perfectly suited for agriculture, energy, insurance, forestry and emergency management applications. The Lancaster 5 Drone launches with PrecisionHawk’s new proprietary mission planning software, InFlight. InFlight introduces a wide selection of intelligent operational capabilities that accommodate enhanced situational awareness, smart battery swap and integrated emergency options. 1 Response to "PrecisionHawk Lancaster 5 Agricultural Drone Price for Sale"
If anyone is thinking about finding the drone then there are lots of places forms where they can purchase the best drone for them. According to the opinion of expert people who are using the drone, they are recommended this best mini drone for the common usage.